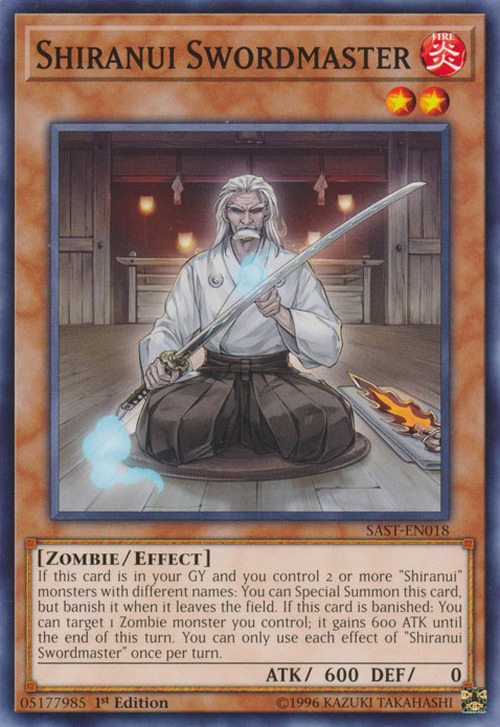 If this card is in your GY and you control 2 or more “Shiranui” monsters with different names: You can Special Summon this card, but banish it when it leaves the field. If this card is banished: You can target 1 Zombie monster you control; it gains 600 ATK until the end of this turn. You can only use each effect of "Shiranui Swordmaster" once per turn. This monster might be the older Shiranui Samurai. This can be seen with him cleaning Shiranui Spectralsword and the sword from the card artwork of Shiranui Spiritmaster beside him. 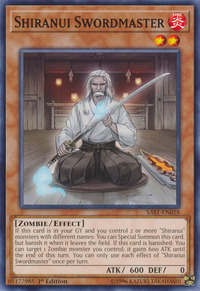 This monster appears in the card artwork of Shiranui Style Solemnity.